This Monday! Apply to ILG 2019! 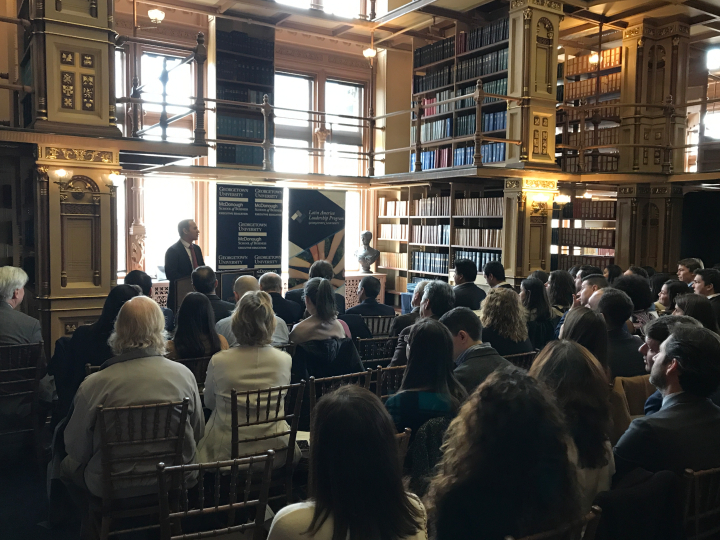 Georgetown University’s Latin America Leadership Program (LALP) aims to connect and empower a new generation of socially responsible, innovative, and ethical leaders, active in the public and private sectors and civil society, in order to create long-lasting and positive impact in Latin America. GCL alum Manuel Carranza presented the book Lideroamerica, Lessons on Leadership in Latin America, a project by GCL 2018 alumni Bryan Avendaño (Colombia), Gabriela Vallejo (Ecuador), Manuel Carranza (El Salvador), Alvaro Gonzalez (Venezuela). Read the latest issue of the Journal of Globalization, Competitiveness and Governability, published by Georgetown University and Universia. In January 2019, Microsoft collaborated with the Georgetown University's Latin America Leadership Program (LALP) to offer the first Microsoft Artificial Intelligence (AI) Challenge during the thirteenth edition of LALP’s Global Competitiveness Leadership Program (GCL) in which 36 young leaders from Latin America and Spain competed to provide a technical solution for a global social problem.